A welcome addition to Ivory's piano library. You might think that Ivory is the last product that needs expanding. Offering three separate grand pianos, it was big in the first place (30GB), and the v1.5 update made it even bigger (40GB). However, Synthogy have now seen fit to launch this optional add-on piano, and it's another whopper. The Italian Grand ships on five DVDs and you'll need 19GB of free hard disk space if you want to install it. Doing so automatically updates Ivory to v1.6, which adds a useful new preset browser. Predictably, the new piano - a 10-foot Italian concert grand - sounds stunning. 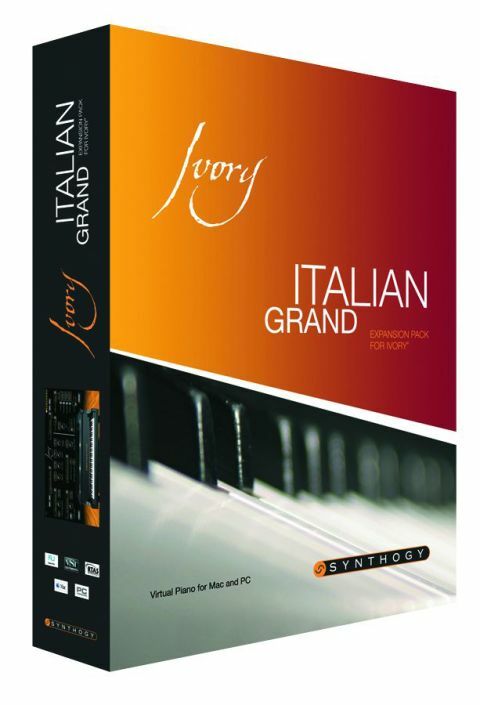 It's slightly different in tone to the original Ivory pianos, but like them, it's rich, expressive and rewarding to play. That said, we do wonder how many Ivory owners will feel that they actually need another piano, as we suspect many of them will be more than satisfied with what they've already got. If you do fancy another grand, though, rest assured that this is a good.